Kidney Stones - body, causes, What Is a Kidney Stone? 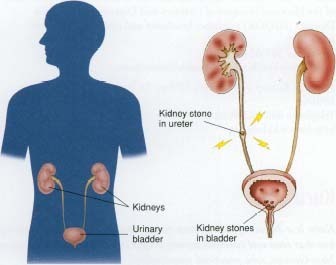 Kidney stones are composed of crystals formed by chemicals that separate from the urine and that build up in the kidney. Most kidney stones pass out of the body without treatment, but in severe cases surgery may be required. The kidneys are bean-shaped organs about the size of a juice-box that are located on either side of the spine toward the back of the abdomen. They filter water, salts, and waste products out of the blood to make urine, and they maintain the body's water and ion * balance. When the ratio of water and ions in the urine is out of balance, kidney stones can form. Kidney stones can be made of various chemicals, but the most common (80 percent) are made of calcium plus oxalate (OX-al-late) or phosphate. Stones also can be formed from uric (YUR-ik) acid and from cystine (SIS-teen). Stones can be as small as a grain of sand or as big as a golf ball. The causes of kidney stones often are unknown. However, a family history of stones, urinary tract infections, and several metabolic disorders may make a person more likely to develop kidney stones. * ions are positively or negatively charged elements or compounds, like hydrogen, sodium, potassium, and phosphate, which are necessary for cellular metabolism. What Happens When People Have Kidney Stones? Although the smallest kidney stones can pass out of the body in the urine without the person even knowing it, the passing of stones can cause severe pain. People have described passing a kidney stone as the worst pain they have ever experienced. The pain occurs when the stone passes from the kidney through the ureter, a tiny urine collection tube, into the bladder. In addition to sharp pain in the back and side, nausea, vomiting, fever, chills, and blood in urine often occur. Large kidney stones can be life threatening if they block the urinary tract and cause the kidney to shut down. Kidney stones may develop in the kidneys or in the urinary tract if crystals of calcium phosphate or calcium oxalate that have separated out from urine grow too large to pass out of the body. Doctors use x-rays and sonograms * , along with analyses of blood and urine to determine if a person has kidney stones. Most kidney stones pass through the urinary tract on their own, with the help of lots of water and pain medication. If the stones are very large (more than one half inch in diameter), doctors can use various techniques to break the stones up inside the kidney or ureter so that the smaller pieces can pass out on their own. Ultrasonic shock waves (lithotripsy), for example, can pass through the body without harm to the place where the stone is located. They break the stone into tiny particles, which then can be passed without pain in the urine. Surgery (nephrolithotomy) is rarely necessary. Kidney stones usually affect people between the ages of 20 and 40. Approximately 10 percent of people will have one in their lifetime, and once a person has had one kidney stone, he or she has a 70 to 80 percent chance of developing another. Therefore, once a person has passed a stone, it is important to find out what kind it is. This information may help the doctor determine why the person is developing the stones, and the doctor often will ask people who have passed stones at home to bring them in for laboratory analysis. Often, changing diet, drinking more water, and taking certain kinds of medication can help reduce a person's chance of developing more stones. * sonograms (SON-o-gramz) are images or records made on a computer using sound waves passing through the body. Kidney stones are mentioned in the Hippocratic (hip-o-KRAT-ik) Oath taken by doctors when they begin their medical careers. Scientists have found what they think is a kidney stone in a 7,000-year-old Egyptian mummy. Approximately 10 percent of all people will have a kidney stone during their lifetime. Kidney stones occur in men more often than in women. Kidney stones usually affect people who are between 20 and 40 years old. Doctors sometimes ask people with kidney stones to cut back on foods and drinks that contain calcium and oxalate, including some fruits and vegetables, some dairy products, coffee, chocolate, tea, and cola drinks. U.S. National Kidney and Urologic Diseases Information Clearing-house, 3 Information Way, Bethesda, MD 20892-3580. This division of the National Institute of Diabetes and Digestive and Kidney Diseases (NIDDK) publishes brochures and posts fact sheets at its website. National Kidney Foundation, 30 East 33 Street, New York, NY 10016.